Alright, before you go any further with this story, click this link and turn your speakers up real loud. It will make things that much better, I promise. Okay, ready? Police in Riverdale, Utah have released the dash cam videos from an incident in which a suspect named Gordon Graham stole one of their cruisers after wriggling out of his handcuffs, leading officers on a frantic chase after their own vehicle. When Graham complained of the heat, an officer opened the sliding window separating the back and front seats, but he was able to maneuver through it and into the driver's seat. That's when he took off, evading even gunfire from one of the cops, who presumably fired because he thought his partner was in danger. 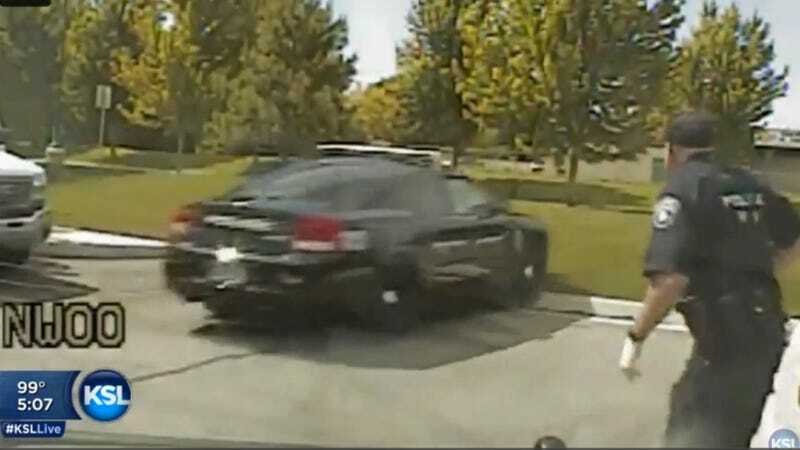 That officer narrowly evaded getting struck by Graham as he sped away. Graham abandoned the cruiser in a nearby area, the newspaper reports, but he was arrested after a two-hour search. Video of Graham driving off can be seen here, as well as in a news report from TV station KSL here. They're both worth watching. Okay, it's a comical scenario, but the good news is that none of the officers were hurt here. As for Graham, hopefully he enjoyed the drive, because it's the last one he'll likely have for a while.